Verovio is a fast, portable and lightweight open-source library for engraving Music Encoding Initiative (MEI) music scores into SVG. Verovio follows the Standard Music Font Layout specification, which makes it easy to change the music font for personalizing the appearance. The upcoming version of Verovio (2.1) includes input via ABC notation. Checkout the documentation page for some examples. Verovio 2.0.0 is out! This is the first stable release to support MEI 4.0. Many thanks to all the contributors. We are making it even easier to embed music in a webpage, with just a few lines of code needed for displaying MEI or MusicXML files. Users can switch between a responsive and a document view. Checkout the JSFiddle. Verovio is not fast enough for you? Try the WebAssembly version of the MEI Viewer that was just updated. With Webassembly, an upcoming standard for the web, it runs faster – more than 2x faster in Chrome. Verovio is developed by the Swiss RISM Office with the support of the Swiss National Science Foundation. The project receives dedicated financial support from the Digital Mozart Edition, a joint project of the Salzburg Mozarteum Foundation and the Packard Humanities Institute, Los Altos/CA. It also receives in-kind support from the Saxon Academy of Sciences in Leipzig. The source code is available on GitHub under the LGPLv3 license. The SVG output of Verovio is designed as an intermediate reflowable layer that facilitates the development of interactive applications, such as music notation editors or interactive digital editions. It works on desktop computers but also tablets and mobile devices. 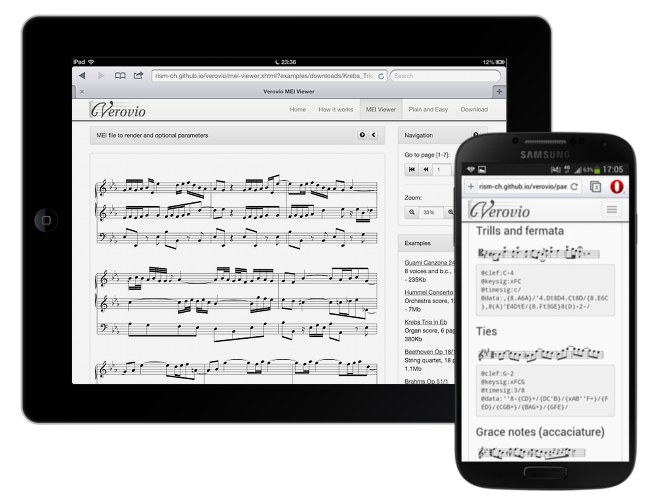 Verovio also provides basic support for other music notation format, such as MusicXML import and MIDI output. Do you use Verovio? Let us know! Verovio is named after a Dutch music engraver, Simone Verovio, who was active in Rome in the late sixteenth century. He was one of the very first to use engraving on copper plates for printing music, a technique that was revealed to be the most suited to music about one century later.